The soon-to-open Veranza Mall announces job hiring! More job opportunities for South Cotabateños are available at Veranza Mall which is now being constructed right beside KCC Mall of Gensan. Below is the list of Veranza Mall Job Vacancies available for job seekers. Graduate of any 4-year computer related courses. At least 2-years in college. Fit to work and can work with less supervision. At least 5'4" in height for female and 5'6" for male applicants. Preferably with experience in selling. Graduate of any 4-year computer related course. With pleasing personality and has a good communications skills. Graduate of any 4-year course preferable BS HRM or any business-related courses. With at least 1 year experience in managerial positions in food chains of costumer service. Has exceptional communication and leadership skills. Graduate of BS Mechanical or Industrial Engineering course. With or without experience on field. Has good communication and leadership skills. 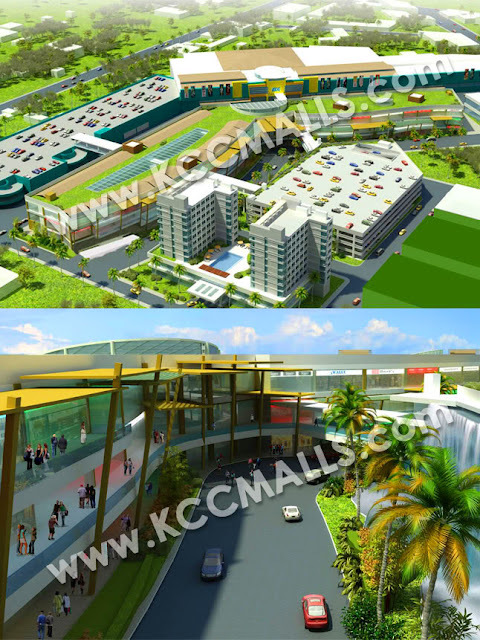 Interested applicants may apply at KCC Mall of Gensan, J. Catolico Avenue, Lagao, General Santos City. Look for Hermie Aronales or call (083) 553-6551/ 554-5555 or attend the SPECIAL RECRUITMENT ACTIVITY on September 24, 2012 at the Oval Plaza Gym. 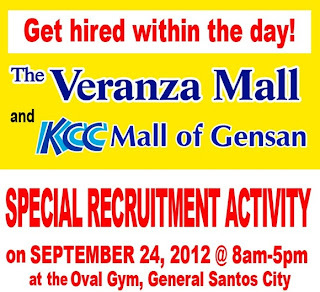 More Veranza Mall Job Vacancies will be posted here soon, so always check back South Cotabato News. For job posting and job hiring announcements, email us at nanardxz@gmail.com. Have you followed @southcotabato on Twitter?